Rahul's Blog and collections: Suomenlinna Ahoy! The boat rocked heavily as the stem ripped through the mass of floating ice. The sky turned grey and the icy wind cut through the warm jacket like a knife going through butter. It was freezing cold as the temperature dipped to -5 deg C . We were headed to Suomenlinna island which is at a twenty minutes distance from Helsenki. The Uspenski Cathedral with its prominent dome was receding from the view. The beautiful city of Helsenki looked even prettier from distance out at sea, under the blanket of snow. The boat ride in the choppy water of Baltic Sea with mass of floating icebergs reminded of Titanic except that this journey was a safe one! The body was numb with cold as the wind was very strong leaving little sensation in fingers! The previous day we had arrived from Copenhagen into Helsenki as the plane made a soft landing at Vanta airport with the walls of snow on either side of the runway. The city has some pretty sights in the city centre, especially around Senate Square, a grand specimen of neoclassical architecture. Uspenski Cathedral, the largest Orthodox Church, in Western Europe, represents Helsinki’s Byzantine-Russian architectural heritage and stands tall. Our next destination was Suomenlinna! Suomenlinna is one of the world’s largest historical maritime fortresses. Built on six islands in the 1700s, the garrison town is among the most popular sights in Finland and a living district that is home to just about 800 residents. 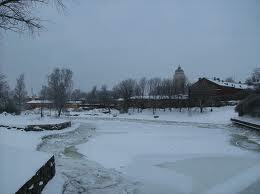 Suomenlinna has been a UNESCO World Heritage Site since 1991. We boarded the municipal ferry which departs from the Market Square. The short ride on the upper deck was like a journey never before, notwithstanding a long naval career! As we stepped ashore the feet sank almost till the thighs in the fresh snow! There were few visitors besides seagulls giving us company in the desolate wilderness! We were transported to a whole new world of pristine aura. An hour at this lovely retreat left indelible memories of an ecstatic journey! Lucky you...how I wish I could run away from the daily rigmarole. @Claudia- Thanks for visiting my blog! @ Alka- Yes, I thank god for bestowing good fortune to visit some nice destinations! @ Madhulika- Thanks! Am sure you will see many nice places! !